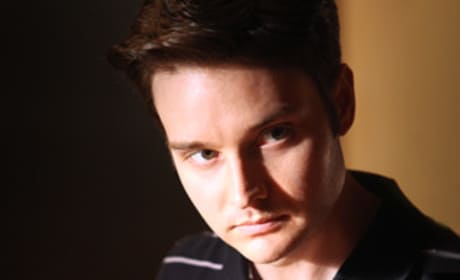 The reverend of the Light of Day, Steve Newlin (Michael McMillian) is not looking very happy. We're going to say it's either because of vampires... or Jason Stackhouse banging his wife. Eric means business as he sits in his office... in a jump suit. Hey when you're a thousand year old vampire you can set your own fashion trends too. Looks like Tara is able to forgive Eggs' past as she gets close with him on the couch. I'm gonna say it's his ridiculous 12-pack he has going on. 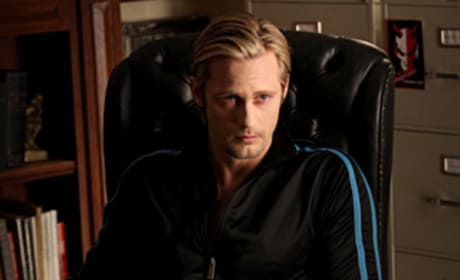 Just who is Sookie holding at gunpoint on next week's episode of True Blood, "Scratches?" The beautiful Sarah Newline, the wife of the reverend, is starting to get a little too close to Jason. 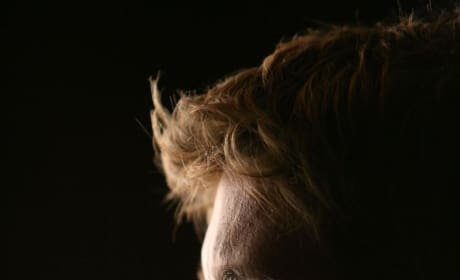 A cool shot of Jason Stackhouse from True Blood in the dark. Maybe that's why he joined the Light of Day? Too cheese? One of our favorite couples on television, Sookie (Anna Paquin) and Bill (Stephen Moyer) share a very intense look in the upcoming second season of True Blood. Sam Merlotte goes for a little night swim in the upcoming second season of True Blood. It looks like things are still good for Sookie (Anna Paquin) and Bill (Stephen Moyer) in the second season of True Blood as she goes to put her arm around him. Bill: I remember when ladies clothing stores sold petticoats. Bill: Actually I sort of miss my times. Clothes left something to the imagination and required a certain skill to get past. Sookie: I think there's a Halloween store around here that sells them.